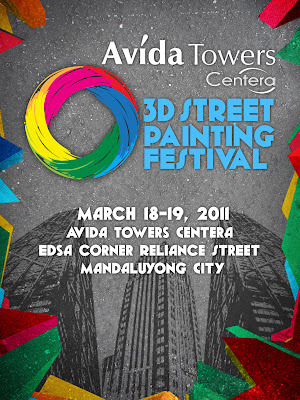 The biggest and one of the most artistic festival is about to happen here in the Metro as Avida Land Corporation holds the first-ever Avida Centera 3D Street Painting Festival. 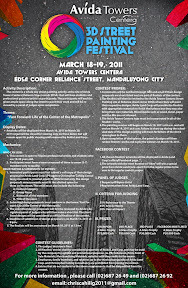 If you have what it takes to be hailed as the best artist to this festival, all you have to do is form a team composed of three to seven members, submit a soft copy of your design proposal (in JPEG format only) to Avida Land Corporation’s PR agency Christopher Cahilig Consultancy (chriscahilig2011@gmail.com) with your group name, names of all the members and title of your art piece. Your submitted design proposals must conform to the theme “Fast Forward: Life at the Center of the Metropolis”. These submitted design proposals will first be reviewed by Avida’s designated panel of judges who will then make a short-list. The short-listed designs will be considered as official finalists to this contest. All those who submitted entries will be notified through text and email if their design proposals are short-listed and by then, they'll be considered as the finalists of this contest. All finalists will then be invited to the Avida Towers Centera 3D Street Painting site at Reliance Street corner EDSA, Mandaluyong City where they will paint their qualified designs. Avida Land Corporation will provide the appropriate materials to the chosen finalists to finish their pieces - they can also bring their own materials except for mixed media like thumbtacks, nails, etc. One of the rules of this design contest is to incorporate the Avida Towers Centera logo. This contest will start time at 10:00 p.m. of March 18, 2011, and each team will be given an 8 hours to draw and finish their designs. The contest is expected to end by 6:00 a.m. of the following day, March 19, 2011, so this will be a real challenge to all participants. And once their pieces are completed, the panel of judges will then review finalists’ works and name the winners on that same day. They also have a Facebook contest. The entry with most 'like' will win special prizes apart from the prizes that will be given to those who will win based from the judges' decision. The prizes that awaits the winners are a glass trophy and Php20,000.00 cash for the Facebook Most Liked, a glass trophy and Php30,000.00 for the 3rd Place, a glass trophy and Php50,000.00 for the 2nd Place and a glass of throphy and Php75,000.00 for the Champion. So, if you have what it takes - flowing creative juices that need some brush and paint - e-mail chriscahilig2011@gmail.com and showcase your God-given talent! For more inquiries you may call (02) 687-2649 and (02) 687-2692.